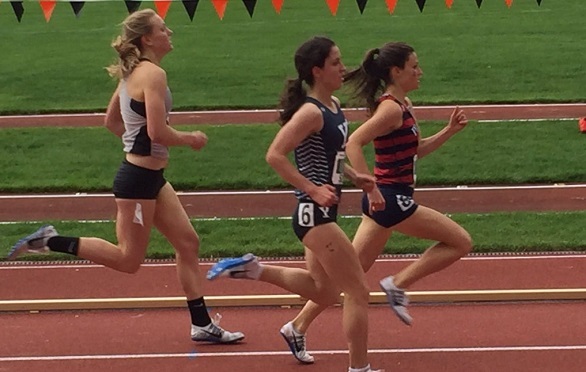 The women’s track competition formally begun with the 1,500m preliminary rounds. The image above show the top three from heat 1, which was won by Penn’s Ashley Montgomery in 4:23.53 (second fastest time of the day), followed by Yale’s Frances Schmiede and Brown’s Clare Peabody. The fastest time of the day came from two-time defending champion Dana Giordano of Dartmouth, who ran 4:22.30 to claim heat 2 steps ahead of Dartmouth’s Helen Schlachtenhaufenin 4:22.40. Other finalists include Harvard’s Paige Kouba (4:22.50), Cornell’s Jackie Katzman (4:23.22), Columbia’s Olivia Sadler (4:24.22), and Yale’s Emily Waligurski (4:24.00) and Meredith Rizzo (4:25.00). Harvard’s Autumne Franklin is on track to her fourth 100m hurdle crown as she ran the second fastest mark in the preliminary round (13.75) behind her teammate Jade Miller (13.74). The times are the sixth and seventh fastest in meet history and a personal best for Miller. Harvard got a third woman into the finals with heptathlete Madison Hansen (14.08). Other finalists include Princeton’s Allison Harris (14.18) and Ellie Randolph (14.15), Dartmouth’s Abby Feeney (14.35), Columbia’s Iris Chijioke (14.38), and Cornell’s Kayla Wong (14.38). Princeton’s Cecilia Barowski ran a new personal best in the 400m preliminary round to lead all of the qualifiers in 53.56 (just outside the meet top 10). She held off top seed Akua Obeng-Akrofi of Columbia in her heat – 54.20. Obeng-Akrofi is joined by her teammate Jaycee Parker (55.08) while Barowski has her teammate Elisa Steele (56.21) joining her in the final. Dartmouth will have two athletes in the final – Jennifer Meech (54.54) and Kayla Gilding (56.84). Other finalists include defending champion Udeme Akpaete of Cornell (54.58) and Taylor Hennig of Penn (57.12). The decathlon finished their shot put and high jump events. Cornell’s Austin Jamerson had the best marks in the shot put and high jump portions of the decathlon – 41-03 3/4 and 6-06 3/4. Dartmouth’s Nico Robinson was second best in the shot put with 41-01 1/2 while his teammate Matthew Sindelar was the second best in the high jump with 6-05 1/2. In the final portion of the decathlon’s Day 1, Robinson ran the fastest 400m time – 50.66 for 784 points. Jamerson wasn’t far behind as he ran 50.95 for 771 points to maintain his overall lead. At the end of Day 1, Jamerson has 3890 points while Robinson sits in second place with 3750 points. Harvard’s Mark Hill remains in third with 3595 points, holding off Dartmouth’s Benjamin Ose with 3540 points. This entry was posted on Saturday, May 7th, 2016 at 2:57 pm. It is filed under Heps Champs, Spotlight. You can follow any responses to this entry through the RSS 2.0 feed.